Handle made of Ebony Wood. White flower design comes with a genuine diamond inlaid in the center. Comes with a leather pouch. Handle made of Polished Stainless Steel. Handle made of Natural Black Horn. Handle made of Maple Wood. Handle replicates the look of White Horn. (Includes leather case in box set). 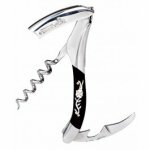 Laguiole corkscrews and wine openers vary in quality and not all are made in France. 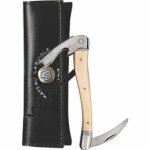 We offer a variety of authentic Laquiole openers by Forge de Laguiole, Chateau Laguiole, en Aubrac, Cepage and Millesime, See Rosehill Wine Cellars for range of Laguiole corkscrews to understand differences.